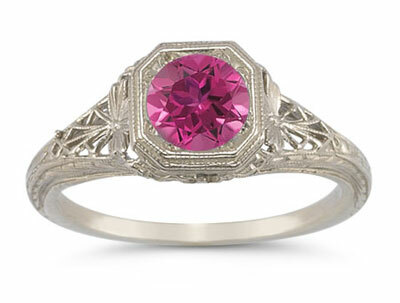 This Victorian Era-Style Pink Topaz Filigree Ring in 14K White Gold is like wearing a work of art on your finger. Its bright and beautiful pink gemstone paired with the ornamental filigree work along the gold band makes for a prized piece to be cherished for years to come. The 6mm round-cut pink topaz sits nestle into a solid gold setting that centers the stone and raises it up to the light where is can sparkle and shine. Just below the setting, on either side of the ring lies the detailed filigree lace work displayed in an artful arrangement to accentuate the vintage-like feel to the ring. The threaded gold eventually leads to a 14k white gold band measuring 1.5mm wide, and the whole piece simply sings of elegance. Carefully designed and constructed, this lovely ring is a fine example of the characteristics of a Victorian-style piece. It is a classic ring that will undoubtedly bring years of joy and inspiration to the one who wears it, as the light casts over the vibrant stone and attractive band. We guarantee our Victorian-Era Style Pink Topaz Filigree Ring in 14K White Gold to be high quality, authentic jewelry, as described above.